Realtime Gaming released a new game this week -- a cops and robbers clot game called Cash Bandits. Golden Euro Casino and mobile casino is offering some nice bonuses for it this month, if you want to take it for a spin! Cash Bandits is 25 payline slot with two jackpots. You can join the Cash Bandits in their quest to capture loot from the comfort of your own home or on the move on a smartphone or tablet. Cash Bandits slot game from Realtime Gaming has Vault feature that awards free spins and multipliers. 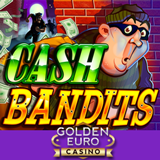 Enter bonus code 'CASHBANDITS' when depositing to capture extra loot straight away -- a 100% bonus of up to €100. In addition, get 10 free spins by using the 'BANDITSPINS' bonus code. While the special 'Cops and Robbers' Scatter Symbols pay in any direction during game play, also look out for the Vault Feature when three or more scattered symbols appear anywhere on the screen. Once the feature is activated, you can emulate the greatest heists of years past by attempting to crack the code and break into one of the vaults to access additional free games and prize multipliers. "We all enjoyed playing 'Cops and Robbers' when we were kids, and Cash Bandits lets you do this for real - without breaking the law," said one player who won a $250 minor jackpot. "There are loads of bonus offers and being able to access the game on mobile easily is a great advantage." Designed especially for European casino players, Golden Euro Casino welcomes new players with €1000 in casino bonuses on their first seven deposits. Golden Euro players share their experiences at the online casino’s Facebook page.